Soul sister, thank you for dropping in! You have just stepped into unlimited possibilities for your life. I would be delighted to share your journey by your side. Tell me, mon amie, is this you? I am committed to my growth. I am on a spiritual path. I am meant to live and enjoy an abundant life with lots of love and sparkles! At times, do you feel sad, stuck, overwhelmed, tired, confused, depressed, anxious? 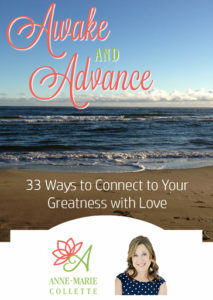 Awake and Advance - 33 Ways to Connect to Your Greatness with Love. Yes! Please send me the FREE E-book! The answers are within you! I am here to help!